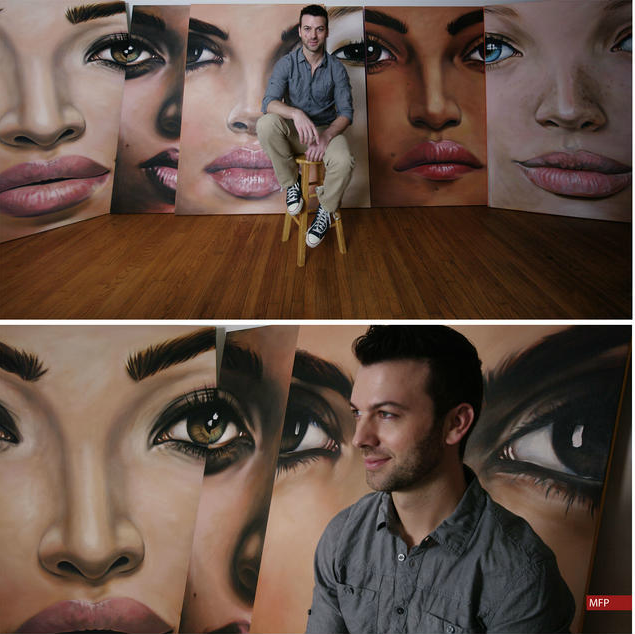 Born in 1980, Ben Sharkey has been selling drawings and paintings since he was in the 6th grade. Sharkey, a successful jazz and standards crooner, attended the College for Creative Studies in Detroit, where he received a B.F.A. in Digital Animation and Multimedia. While studying digital arts, he continued painting and working with interior designers from around the area, such as the Michigan Design Center in Troy and Jones Keena in Birmingham. In 2005, Sharkey exhibited at the Chapman House in Rochester, which brought a number of new commissioned clients. Today, his work is on display at several local businesses, including Luigi Bruni Salon, The Annex, and David & Davis in Birmingham, What Crepe? in Royal Oak, and private residences around the country. In the past few years, Sharkey has transitioned from commissioned work to focus more on his personal artistic development.